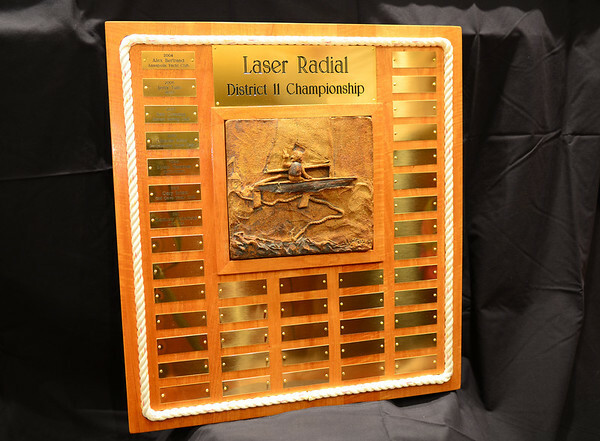 This year the 2014 District 11 Championship for Standard and Radial Lasers will be held at Tred Avon Yacht Club on August 23-24. The District 11 Championship returns to the eastern shore of Maryland for the first time in 4 years and to TAYC for the first time in over 20 years (history). 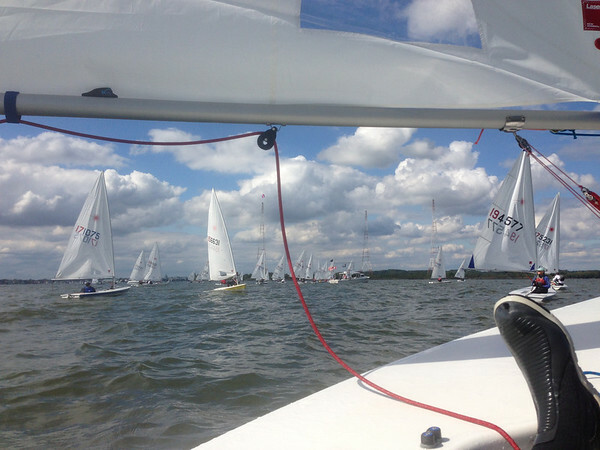 Come sail on the tranquil waters of the Choptank at TAYC known for it’s Annual Oxford Regatta. TAYC is easy drive from most points in D11 including most of District 10 to the north. Not only will you get great racing, great race management by PRO Mike Waters, but you’ll get two continental breakfasts and a Saturday night crab cake dinner. The first 40 to register get a regatta t-shirt! The District 11 annual meeting will be held in front of the club house as soon as practical following dinner on Saturday. Any questions – let me know. Hope to see you there! Tred Avon Yacht Club will be the host of the 2014 District 11 Championship for Lasers and Radials on August 23-24. The regatta will be held on a separate course in conjunction with TAYC’s Heritage Regatta featuring Penguins, Comets, Shields, and Log Canoes. SSA’s Mike Waters will be PRO. Look for an NOR soon. It was consistency that paid off for Mike Russom (GWYC) and Jessica Bennett(DCYC) in winning the Standard and Radial District 11 Championships at Severn Sailing Association. The light winds and often lumpy seas challenged the competitors and made it anyone’s race. 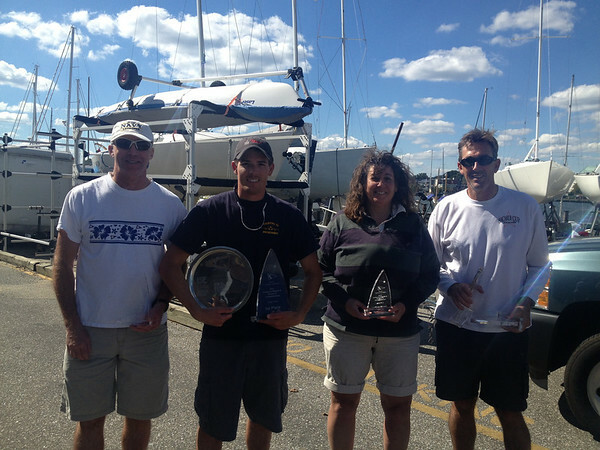 34 Standard rigs and 9 Radials completed 6 races out in the Chesapeake Bay. Saturday’s weather started out with cool temperatures, and overcast skies with a 12-14 knot breeze. After numerous recalls and restarts by the standard fleet – the first race was finally started having been started under black flag. The Radial fleet started their first race with 6 of the 9 boats OCS in what would become the drop race for many. By the 2nd upwind leg the wind was under 10 knots the left over seas were tough to get through. In the 2nd race the wind dropped a little more and so did the waves. By now all starts were under black flag. 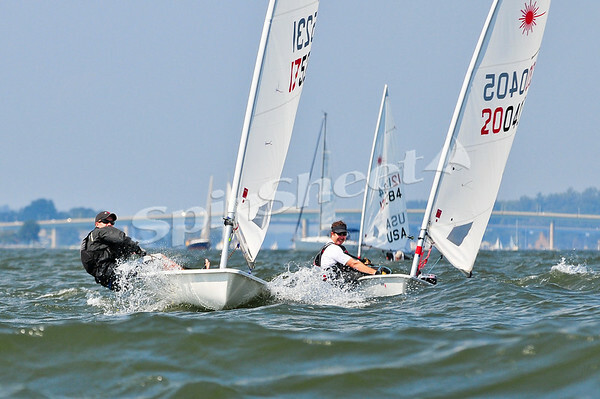 Mike Russom would go on to put up a 4-1-2 to lead day 1 followed by Eric Reitinger (BBYC) just behind him with 2-2-5. Margaret Podlich (SSA) stayed out of trouble and led the Radial fleet with 1-4-7. 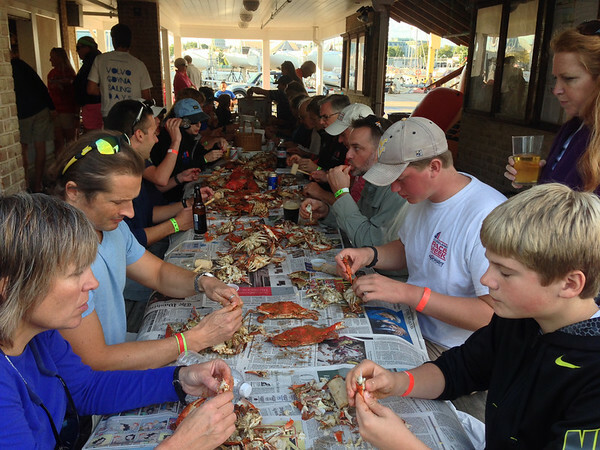 Following racing the sailors enjoyed a crab feast – what else would they have at the ‘Crab Claw’ regatta? Sunday’s racing saw smoother waters and slightly less wind. Jon Deutsch (FBYC), Bill Lawson(SSA) and Brady White (SSA) each took wins in the 3 races for the day in what would lead to a shuffling of the leader board for the Standard fleet. Black flags further shuffled the fleet and keeping others off the podium. In the Radial fleet Kim Couranz (SSA), Phillip Schofield (AYC) and Jessica Bennett all won races. Jesscia’s final race win along with her 2-4 in the earlier races cemented her as the Radial Champion. Jessica got the triple win as not only the overall champion, but the top female and the top junior. Aaron Helmly finished 2nd while Kim Couranz took 3rd. With Mike Russom’s win – District 10 sailors have won 3 out of the last 4 District 11 Championships. (Seriously D11 sailors – we need to do something about that!). Brady White followed in 2nd and Jon Deutsch(FBYC) won a tie breaker for 3rd. 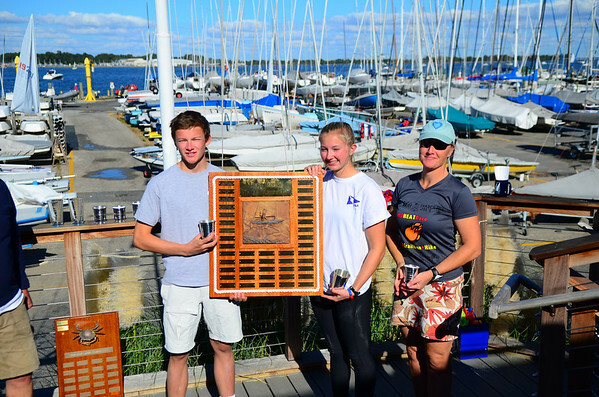 Karen Long (SSA) was top female and Matthew Menzi top junior in the Standard fleet. On behalf of District 11 we’d like to thank all of the competitors for coming and making this a great event. And we’d like to thank Steven Cofer and all of the folks a SSA for everything they did for the regatta. 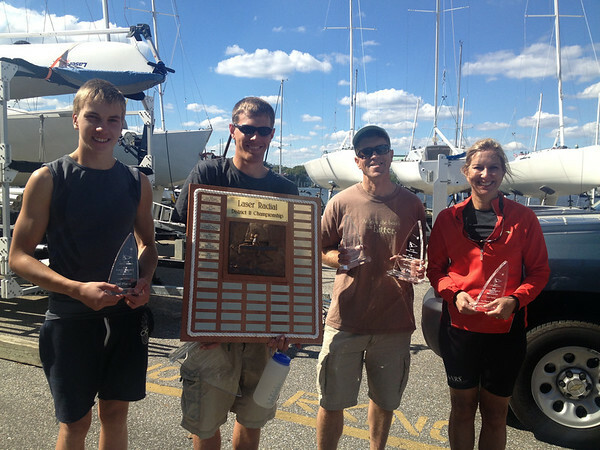 And finally, thanks again to the regatta sponsors APS, Fawcett Boat Supplies, BoatUS and Sandy Westphal. The Severn Sailing Association in Annapolis MD is honored to host the Laser District Championships September 28-29 in our newly renovated clubhouse. Dinner will be served on the beautiful wrap around deck with live music and great views of the Annapolis skyline and the Chesapeake. The newly renovated Dark & Stormy café will be serving their signature drink with homemade ginger beer and a free keg to keep the action going off the water. Racing will be two days for Lasers, Radials and 4.7s (min 6 boats for a fleet) with ILCA-NA grand prix points available for the top finishers. A significant discount is available for those registering before THURSDAY, September 12, 2013. 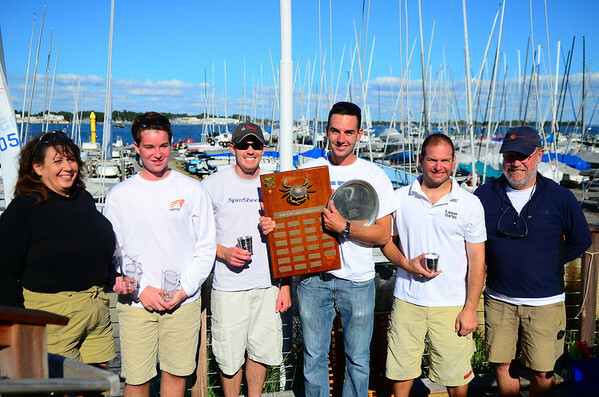 The 2013 District 11 Championship will be held at Severn Sailing Association on September 28-29 in conjunction with their Crab Claw Regatta. Thirty-Three sailors had some great sailing conditions for the 2012 District 11 Championship at Severn Sailing Association in Annapolis. Brady White (SSA) put up all top 5 finishes in 7 races to win the Standard fleet while Eric Reitinger’s (BBYC) consistent top finishes and an OCS by Carsten Faubel (CRYC) gave Eric the win in the Radial fleet. Saturday’s saw 15-18 knots with large swells coming out of the South with the course positioned just north of Tolly Point. As the weather system moved away overnight, the wind shifted to a much colder North wind for 3 more races on Saturday with a little less wind. The top 5 boats in the Standard fleet definitely pulled away from the rest of the pack, but only 3 points separated 2nd through 5th position. The final order after Brady White were Henry Filter (SSA), Eric Reinke (SSA), Luke Shingledecker (SSA) and Kyle Swenson (RTYC). In the Radial fleet Carsten Faubel got out to a great start on day 1 putting up all 1st place finishes while Mike Schmidt (MRSA) and Eric Reitinger traded spots for 2nd and 3rd. An OCS by Carsten on the 2nd race Sunday opened the door for Eric to seize the championship. Thanks again to all of the folks at SSA for the great crab and chicken feast and for hosting our District Championship! Thanks to Spinsheet for the photo above. The rest of the photos can be seen here. The Notice of Race is posted and online registration is now open for the 2012 District 11 Championship at Severn Sailing Association on September 22-23. 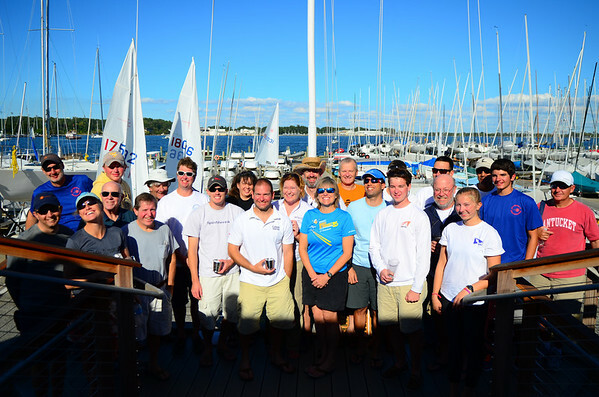 Join us for Standard and Radial fleet racing in Annapolis for a ILCA-NA Grand Prix event. AND as SSA’s traditional fall regatta, there will be PLENTY of crabs for picking on Saturday night. And don’t forget we’ve got a brand new D11 Laser Radial Championship trophy so don’t miss your chance to be the first winner to hoist this over your head in victory! Check out all of the past Standard and Radial D11 winners.